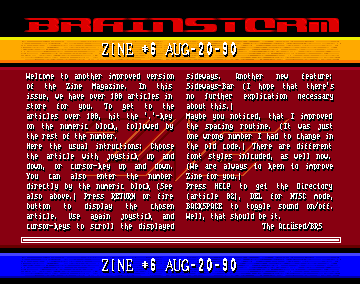 Zine #6 magazine was first pread on the BBS's on 25th of august. ¹Alan of IMPACT INC. was interviewed by Chester of BRAINSTORM. ³-Tell us the story of IMPACT. 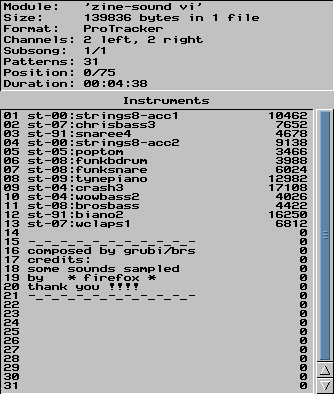 ¹IMPACT INC. started on the C64 in july 85 approx. I dont remenber who found the name IMPACT, at first we had 4 members, after some cracks we kicked one (he was a lazy man). 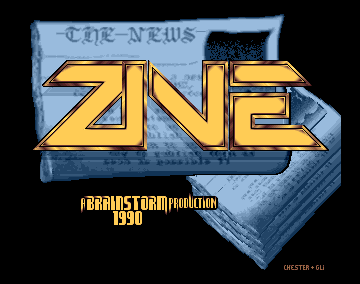 ¹Image was born in the end of june 1990... so it's still fresh and shiny! ³-Who were the founders of IMAGE? ¹Well, Image was founded by the best members from Exodus and Unique... and Hyde of Complex was also one of the main organizers. ³-Now, tell us the whole story about your group. Shadow of ASSIX was interviewed by Chester of Brainstorm. ³-What has happened to Crionics, why did they die? -"DIRECT" is a very good name for a group. When was DIRECT founded? ¹In october 1989, but at that time we were only 5 members, now we are 8 members in Denmark and 1 in Norway. ³-Give us a sommair memberslist. ¹Here we are at the TSL/RSI COnference... The atmosphere is very noisy... but nice music from CINEFEX DESIGN and Slayer/Scoopex has got a Mental HANGOVER. And not only a mental one, in fact he is DEAD-DRUNK... But here comes ICY/Cinefex Design. So let's make an interview. Cinefex design was interviewed by ARRAKIS/Brain Wave. ³-Cinefex Design is a quite recent group... Can you remind how it was build up? CRB interview has been made possible by Majestic of Brainstorm. ¹My name is Jackmix and I'm a member of Cryptoburners. -³Introduce CRB to us, with some historical information about it. ¹Well, Cytoburners was formed in the beginning of 1989 by Heatseeker and Windwalker. And CRB consisted soon of 8 members. Some members was kicked out after the Arendal party. And in August 1989 the Ghostriders joined the CRB team. Now we had 15 members. One quit, and sold his amiga. This interview was done with LIX of FRAXION. MARTIN LIE(Lix of FRX), Odd S0rlisvei 27, 7058 Jakobsli, Norway. But please no heavy things. My old postman, who is nearly 60 years, have not so good health. Hope you all understand my BIG problem!!! ¹We were walking about seeking for some beers when we met the guys of Triumph... Yep, a quite new group... So it was really worth interviewing them! Another worldwide exclusivity for Zine! The questions were asked by Arrakis of Brain Wave and answered by Mr.Maniac. -³Hi! I think you group is only a few months old? ¹Yes, Triumph was founded about X-mas times last year by the former members of The Band Norway and The Mafia. -³Give us a little memberlist! Hi, guys from PowerDrive! It is now 4.03 am and we're at the Silents-Red Sector Party. 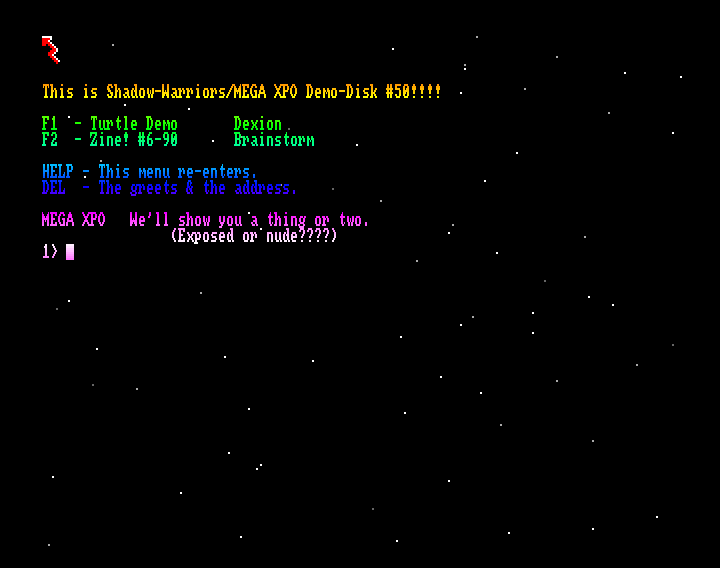 Vision Factory and Fairlight are boozing around and we're gonna ask some questions to Ralph 124C41+ of PD. ¹PowerDrive was founded in December 1988 when the members of Castor Cracking Group (on the Spectrum and C64) all had got themselves Amigas. Our first release was a three parted demo called "Computers in control". ³-What's your age and position in PowerDrive? Rocket of Hypnosis was interviewed by Arrakis of Brain Wave. ¹This is Rocket of Hypnosis, Swapper, 18 years old. ³-When did Hypnosis start in the scene? The Pride of FLASH PRODUCTION was interviewed by Chester of BRAINSTORM. ³-First, I want to know your age and when you have started computing? ¹I'm 19 years old and I started computing in 1986, when I bought my C64. ³-Why did you buy a computer? to play games, so I bought my C64. ³-I think FLASH was also on the C64. First, give us a short history about the group! The interview was hold by Chester/Brainstorm with ZYR/Setrox in front of the Dial-Computer-Club in Basle/Switzerland. ¹The motivation has gone, because we couln't get better, in fact we trained about 90% of all games together with Alcatraz. We also hadn't got an original-spplier.. There was also a question of money, like the phonebill. And of course the struggle between Cortez and Pioneer, and Cortez was the one who have done most of the work. This is New Deal of ACES writing. I want to thank everybody who came to the great copy party of ACES-VISION-ACTIVE... the PRIME ´90. Without all you guys visiting it, it wouldn´t be one of the best partys ever! ²  THE SILENTS - RED SECTOR INC.
¹The prestigious organizer's names of this conference promised the perspective of a great party. It was held in Glostrup (Denmark) in a big hall with a gymnasium to sleep in. Also there was a swimming-pool and as the weather was quite hot (the second day!). It was nice to enjoy the water! The party was hold in Iisalmi/Finland, started at the 10th to the 13th of August.